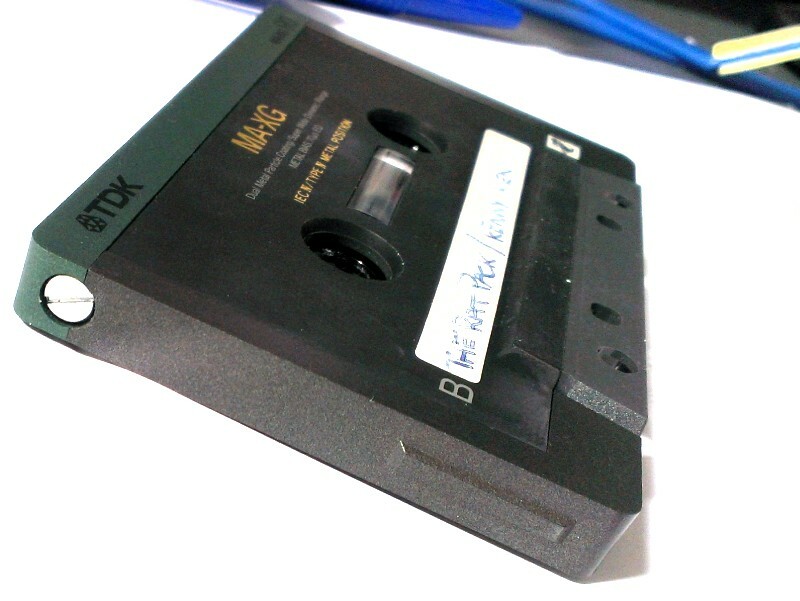 As well as analogue tape, at Great Bear we also migrate digital tape to digital files. Digital media has become synonymous with the everyday consumption of information in the 21st century. Yet it may come as a surprise for people to encounter digital tape when we are so comfortable with the seemingly formless circulation of digital information on computers, at the cinema, on televisions, smartphones, tablets and other forms of mobile media. It is important to remember that digital information has a long history, and it doesn’t need to be binary or electronic – abacuses, Morse code and Braille are all examples of digital systems. Digital Betacam tapes were launched in 1993 and superseded both Betacam and Betacam SP. Betacam remains the main acquisition and delivery format for broadcasting because there is very little compression on the tape. It is a very reliable format because it has a tried and tested mature transport mechanism. 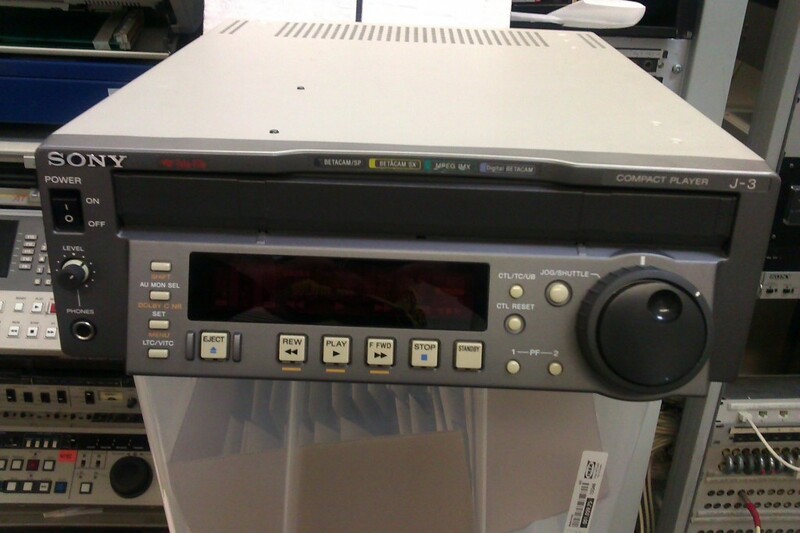 While Digital Betacam is a current broadcast format, technology will inevitably move on – there is often a 10 year lifespan for broadcast media, as the parent company (SONY in this case) will cease to support the playing machines through selling spare parts. 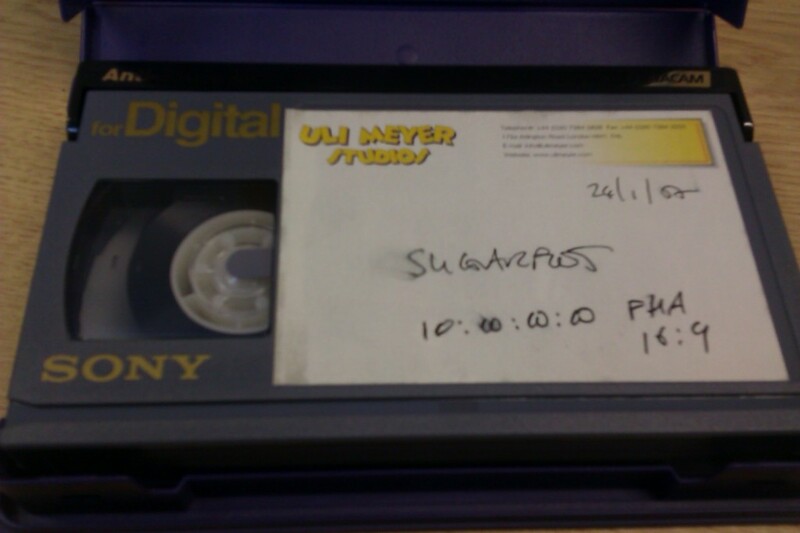 We were sent some Digital Betacam tapes by Uli Meyer Animation Studios who are based in London. Uli Meyer make 3 and 2 D commercials, long and short films and TV commercials. 5-10 years ago the company would have had Digital Betacam machines, but as technology develops it becomes harder to justify keeping machines that can take up a lot of physical space. 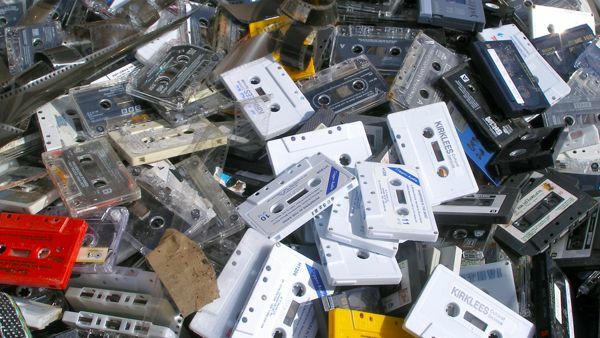 Workflow in broadcasting is also becoming increasingly ‘tape less’, making digital tape formats surplus to requirements. Another issue facing the Digital Betacam is that it records information in Standard Definition format. With broadcasters using High Definition only, the need to transfer digital information in line with contemporary technological requirements is imperative for large parts of industry. We have recently been digitising Betacam SP (‘superior performance’) video recordings, a cassette based component analogue format that is used extensively in the broadcast world. Betacam SP offered fantastic video and audio quality from its introduction in 1986, and a very similar digital cassette, Digital Betacam, is still used now. Betacam SP was commonly used throughout the 90s and 00s and was not threatened with obsolescence as many older formats are. However Betacam VTR machines will soon become very hard to find spares for, thus becoming another threatened video tape format. Luckily at Great Bear we have every type of Betacam machine (PAL and NTSC) available, as well as spare parts (such as head drums), so we are able to migrate analogue formats to digital so they can be utilised by current media practitioners. The tapes that have inspired this post are public domain tapes from the National Archives in the USA. They feature the tension filled politics of the Cold War, including footage of President John F. Kennedy, missile silos, Stalin, B29s taking off, graphics of the Iron Curtain, air raid warnings and people running into shelters. Collectively they give a powerful impression of Cold War international relations from the perspective of the American government. The tapes were sent to us by renowned investigative journalist Paul Lashmar and were the raw material for his BBC Timewatch programme Baiting the Bear: How the real life Doctor Strangelove brought us close to Armageddon, aired in 1996. Paul has covered many of the main news stories of the past 30 years related to terrorism, intelligence, organised crime, offshore crime, business fraud and the Cold War. He has written for newspapers such as the Independent on Sunday, the Guardian and the Evening Standard, is a regular TV and radio broadcaster and a lecturer in journalism at Brunel University. At Great Bear we work on a range of digitising projects. 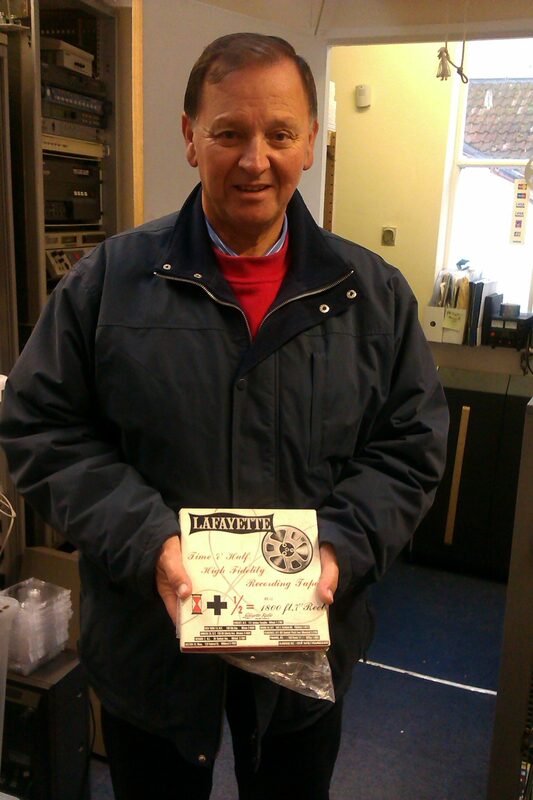 Today we received a ¼ inch open reel polyester and acetate based tape from Carmarthen based teacher Richard Lewis. The tapes are a good example of the types of personal material we are entrusted to digitise. The tapes are rare and valuable recordings of a choir performance in Hereford Cathedral in the mid-1960s. Richard sang in Hereford Cathedral Choir from when he was 10-14 as a soprano and his father, Albert Lewis, played the church organ. Richard thinks there may be recordings of his Great Aunt on the tape, but isn’t sure because he hasn’t been able to listen to it for years. 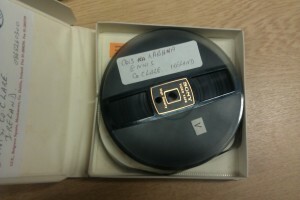 He says ‘he is fascinated to know to what is on the tape’ and is looking forward to hearing the digitised results. We recently had a call from Martyn Ford, acclaimed horn player and arranger on many big albums over the years. Yet again bad capacitors have reared their electrolytic fluid! This time in a Gundig Video 2000 video tape player, or V2000. 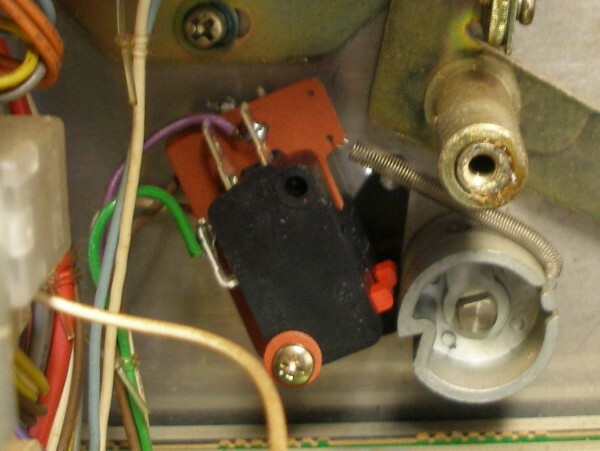 Pictured above is a X2 mains film cap in the power supply of the video machine, made by Frako. This brand of capacitors are German and used in many Studer audio tape machines too which commonly have similar smoking fun such as the B67 and sometimes the A80. A nice satisfying repair though – all Frako film and electrolytic capacitors were desoldered and replaced with 105 degrees rated Panasonics. 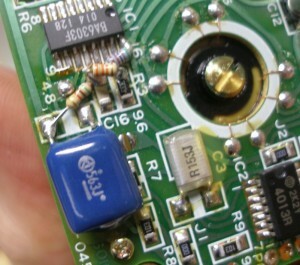 The circuit boards on these type of machines are also well made with thick tracks so there’s little risk of lifting solder pads with this type of repair. Other than their ageing capacitors and some dry solder joint problems these Grundig machines are excellent although as with many older domestic formats the important proprietory spares like the V2000 upper head drums are very rare new now so keeping these machines running will get harder and more expensive over time. It’s a good idea to digitise and transfer any video recordings on formats like Video 2000 to file based digital formats or at the very least DVD sooner rather than later. We’ve recently had an interesting archive of poorly stored and initially unplayable half inch, EIAJ, black and white video reels dating from the late 1970’s and early 1980’s. This format was commonly used in education and in industry and was much cheaper than the u-matic and one inch formats. We usually see Scotch and Sony branded tape stock in this format. The Sony tape, is absolutely unplayable and dangerously so. It becomes ‘sticky’ or suffers from binder hydrolysis as Ampex audio tape commonly does. The tape will squeal loudly on any fixed guides and often stop moving around the head drum often damaging the head tips. 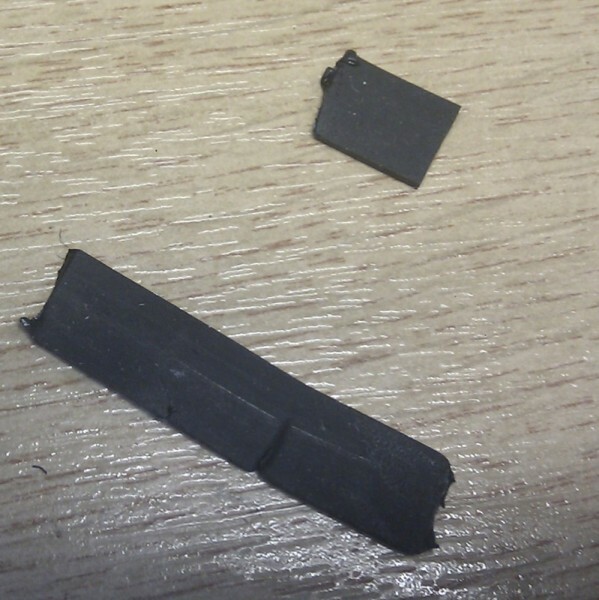 This tape can be restored and recovered but must be dehydrated at a very stable and constant low temperature. We’ve found this tape takes much longer than audio tape in this process and it’s also necessary to address any tape pack slip too. Custom winding machines are essential here as winding this tape on the vintage machines necessary for playback is too aggressive. The image to the right is a tape we received and has an uneven tape pack and a small amount of mould growth too. 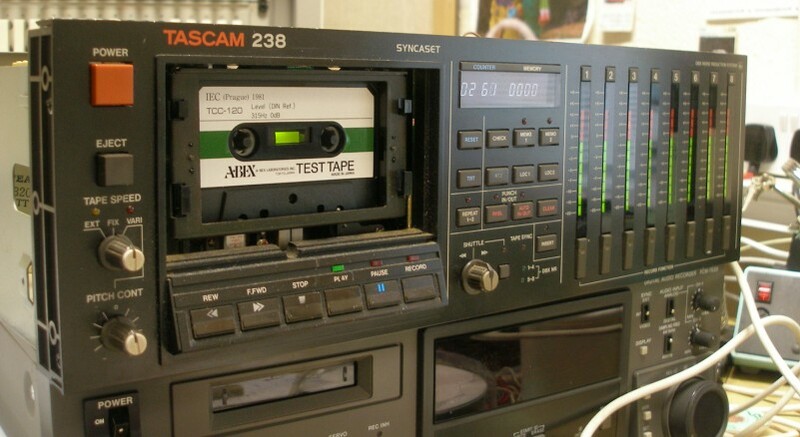 Early tape based digital formats such as DAT, Tascam DTRS and ADAT, etc are often problematic now, partly with tape issues and also reliability and spares availability. In 20 or even 10 years time these machines will be much less serviceable than the analogue tape machines of the previous generation and as a result more obsolete and a higher priority to migrate to a file based digital format. We’ve also started to see a particularly nasty problem with some, and usually the 120 minute length, DAT’s. The first symptoms are a broken DAT tape usually on wind. The tape pack seems to become slightly sticky, with intermittent tension between the layers of tape and with the thinner tape in 120 lengths this can sometimes break the tape on wind. You can see in the above image how the tape sticks slightly to the pack and then releases when hand wound. With the greater tension of a machine wind and the tape also wound around the head drum this becomes risky. With large transfer jobs checking each DAT by disassembly is not feasible but the permanent damage and / or part loss of a section of audio caused by a break is not feasible either! Contact us, of course! No seriously, how to transfer video to dvd or any other digital format is a very simple concept but the reality can be pretty complex. As with much mature technology, the domestic video formats and machines were often made pretty straightforward to use and hid much of the complexity of analogue video from us. The simplest methods are to use the few machines ready made for the transfer purpose but these were only made for the most common video formats. Several manufacturers made VHS to DVD units and these can work well if MPEG2 DVD Video is the only format you require. The problems come for the less common formats and when the tapes themselves start exhibiting physical problems. Times are changing though and even the most common domestic formats like VHS will soon become harder to work with. While it’s still possible to buy older video machines that may work and your old video machine at home or in the attic may still work this situation is changing fairly quickly. Very few manufacturers carry a full range of spares for their older machines anymore and often what stock they have, once sold is never remade. Even in the professional and broadcast markets companies like Sony only guarantee spares support for equipment up to 10 years from manufacture. What this all means is that to support a range of legacy, analogue video formats as we do, constant sourcing of parts, parts machines, obsolete service manuals and older specialist knowledge is vital. 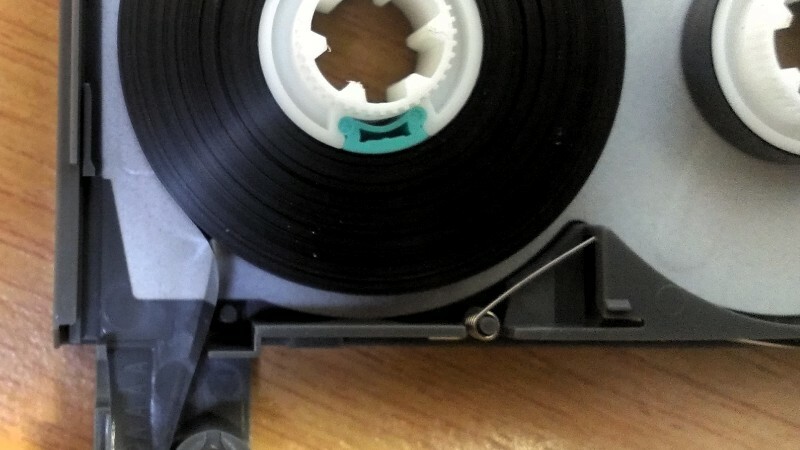 this isn’t always easy or cheap and highlights one of the key issues in digitising video tape. The Teac A3440 is a classic reel to reel tape recorder from the late 1970’s, early 80’s significant in that you could use it to make 4 track multitrack recordings at 15 inches per second, the professional tape recording speed. At the time there was precious little else around at the price to do this so this machine was perfect for small bands and studios who didn’t have the wallet busting amounts needed to buy a larger format 16 or 24 track recorder. 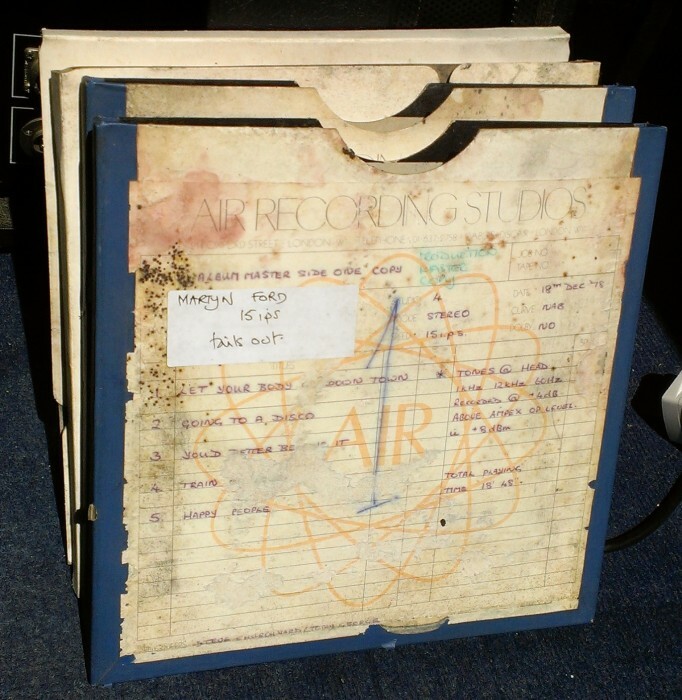 While the A3440 isn’t the last word in high quality analogue recording it has had some significant users in the past none less than Lee Perry who’d used the earlier but similar A3340 on his Heart of the Congos album. This machine didn’t initially look heavily used, the heads had little wear but it hadn’t been used in a long while and there was a heavy build up of tape residue on the whole tape path. The capstan was very dirty and i these cases xylene is a more effective cleaner than IPA but don’t get it anywhere near plastic! This A3340 powered up but the right hand tension arm was hanging at an odd angle and it wouldn’t play or wind. Time to take it apart – the fake wood sides and rear panels get removed and it’s pretty easy to see what one of the problems is. A very nasty ‘melted’ rubber capstan belt that took a fair while to scrape and clean off with IPA. A new belt has purchased online – Teac parts in the UK are a big pain to get hold of through the official channels and I’ve given up contacting them unless I’m desperate for a part I can’t find anywhere else. The other lack of drive was caused by broken micro switches. When the right hand tension arm is moved up, two micro switches behind the front panel switch power on for the capstan and reel motors. As this arm can get a los of use / abuse it’s common for the micro switches to crack. Both on this example were broken as was the small plastic piece that stops the arm moving too far down. Remove both screws holding the capstan flywheel against the front panel. Make sure the flywheel is cleaned of all old belt debris. Make sure the motor wheel is cleaned of all old belt debris. Refit new belt over small motor wheel, then flywheel. Replace bracket remove in part 1, making sure you’ve cleaned off the old grease and regreased where the end of the capstan shaft can run. Although not essential I took the opportunity to remove the whole capstan shaft, clean, check for wear and reoil before putting back. If you do this you will need to reset the endfloat though. Make a note of or photograph wiring connections for switches. Unscrew and carefully desolder the existing microswitches. Connect wires and solder the new switches in. The arm end stop was repaired easily with strong super glue and after many hours is still holding. In a word, kind of! The belt and microswitches got the deck and transport moving. It will pull tape and make a noise which is great but an annoying intermittent problem started to appear after some initial testing. When play or wind are selected, large solenoids clunk and release the reel brakes and move the pinch wheel. This was working BUT occassionally and only in play the right reel brake solenoid didn’t move, leaving the brake on, causing the tape speed to slow, back tension to increase and wow to go crazy! In essence audio archiving, digital migration, transfer or digitisation, whatever term you prefer, is conceptually simple, one analogue or digital format is moved to another, usually digital, format. It is in the details of this process that things can get complex requiring experience, specialised tools and often custom-built solutions. This job has many factors not just attaining the best analogue transfers but also addressing the organisation of such a large amount of 10.5″ reels, their digital management once migrated and the creation and management of metadata. The archive, dating from the 1950’s up the early 90’s, even though it had been stored in less than ideal conditions, is in generally good condition. An interesting and often fantastic sounding collection of recordings and music are evident all recorded at 15ips in mono, stereo and some encoded with Dolby A noise reduction. 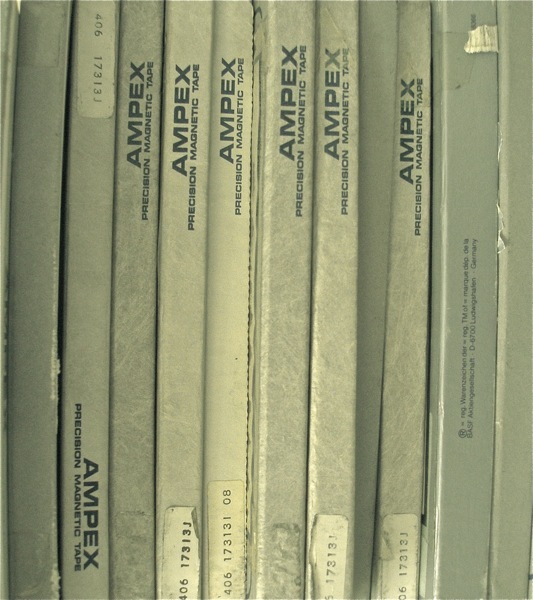 Binder hydrolysis or sticky shed syndrome (SSS) has affected a significant proportion of the archive in particular Ampex branded tapes from the 1980’s onwards. Some glue used in spices from the 1980’s spreads over time and tends to stick layers of tape adjacent to the splice together. This can be a very frustrating problem which rarely damages the tape but affects the tape tension on certain sections so that head to tape contact is momentarily lost and a very obvious audio glitch noticed. The Analogue side is important to get correct initially but the management of the data is critical with such a large number of reels and individual artists and tracks. Each batch of tapes would be catalogued in a .csv file. The digital audio transfers were split into individual tracks which then had to be renamed based on the data in the .csv file. This was handled by some php coding which matched the metadata supplied with the files, checking for inconsistencies then renaming the .wav files on one of our servers. This type of customised workflow can be tricky to setup initially and find the balance between accuracy and speed but once done a smooth workflow is possible maintaining high quality, accuracy and value. We specialise in tape transfers, especially cassette tapes. Tascam, Fostex and Yamaha sold cassette multitrack recorders in the golden days of home recording in the 1980’s and 90’s. 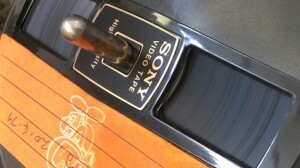 The 4 track format was especially popular but an 8 track format was also developed that squeezed even more out of the small tape width of the cassette. The 238 and other 8 track and high quality stereo tape decks, the 688 and 122 MkII and III, used a direct drive capstan motor for precise speed control and reduced speed variation or wow and flutter (w/f). The circuit that controls this motor fails in certain ways causing lack of speed control and in our case the capstan motor wizzing away at a crazy speed, not the 9.5 cm/sec that it should do. This here is the culprit – you can see the attempted repairs which didn’t ultimately work. 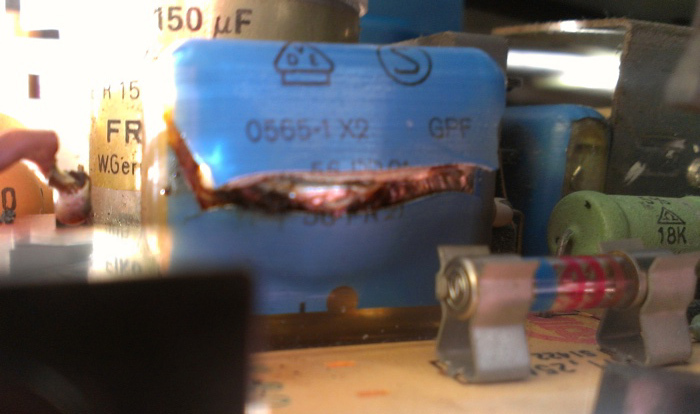 One common failure is that the surface mount electrolytic capacitors fail or their capacitance changes to such an extent to cause speed problems. These can be changed for standard through hole caps but you do need to be very careful as the tracks are damaged very easily – good tools are essential. 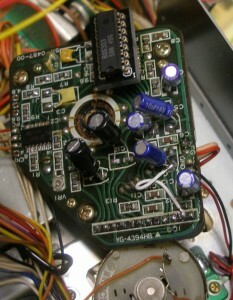 The other point of failure in the circuit is the BA6304F SO16 IC – we even changed this but the motor still didn’t turn! There was some suggestion from previous repairers that the grease at the end of the capstan flywheel hardens over time. increasing the friction and causing problems with the circuit. This can become frustrating quickly, especially when you have a large archive of cassettes to digitise. When we can’t repair we reluctantly do the next best thing and buy the whole replacement part but this is another exercise in frustration. 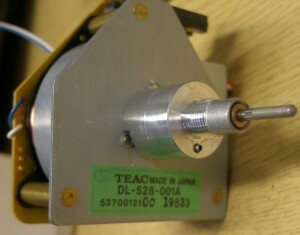 Teac parts and Teac UK don’t have any european supply of this capstan motor (part no. 53700075-01) anymore as of November 2011. Interestingly about 6 months ago they did at around £60 GBP, then about 3 months ago they had one left at £160 GBP! Lots of emails later to Teac US, Teac Canada and Teac Japan there seem to be a nice stock still on shelves somewhere and at reasonable prices UNTIL you ask them to ship to the UK when you discover they can’t do this and I’d need to go through Teac UK!!! I’m pretty persistent but I gave up finally even though some of the support staff tried to be pretty helpful. We find support for older machines from the original manufacturers is not good generally and unreasonably expensive when you can find it. This is similar across audio and video, semi-pro and professional products. Some companies are easier to deal with and have better parts situation than other but stockpiling machines, parts, manuals and obsolete knowledge is the best course of action. You also need to solder / desolder the speed pads, to change the motor speed from 4.8 cm/s to 9.6 cm/s that the 238 needs to run at. It’s also a good idea once you’ve got the capstan motor apart to clean the old grease from the seat, check the end float which can be adjusted using the screw shown on the left and apply new grease to the capstan end. Put it all back together – be careful to solder the wires to the motor to the correct pads – they’re different on the 122 and test… Ours worked almost perfectly. For 4 track and 8 track multitrack cassette transfer please contact us for more information. copy tape to cd, convert video to dvd, is it a good thing? Digital formats are great and the ease of access and distribution that an Audio CD and a Video DVD offers is fantastic at the moment with cheap players, recorders and personal computers. In the audio and video tape transfer business, getting your business website to rank well in the search engines for key phrases such as ‘copy tape to cd’ or ‘convert video to dvd’ should get you a steady stream of enquiries from people who, primarily, can’t access their tapes any more. The preservation of the valuable recording is usually perceived to be CD or the DVD. Optical Media that can be burnt using computers, CDr and DVDr, are not as reliable as commercially produced or ‘stamped’ discs and their quality and longevity can vary between different manufacturers. The digital video stored on a DVD Video is a lossy compressed format that depending on the original footage and if pushed for too much running time can easily make the digital transfer look much worse than the original – not a good reason to transfer the tape! The everyday nature of audio and video discs and some of the domestic technology we now have has conspired to make what is and can be a complex, time consuming and often problematic process too simple in the eyes of many people. Since the early marketing of the compact disc in the 80’s by spreading jam on it to highlight it’s resilience compared to vinyl or tape many of us have been taken in by this and have a skewed belief on the longevity of CD and DVD optical media. In fact optical media can degrade and become unreadable and unplayable in a very short space of time even with good storage practices. Tape based storage formats of course have their numerous problems but they can often be incredibly resilient over time even in under poor storage conditions. 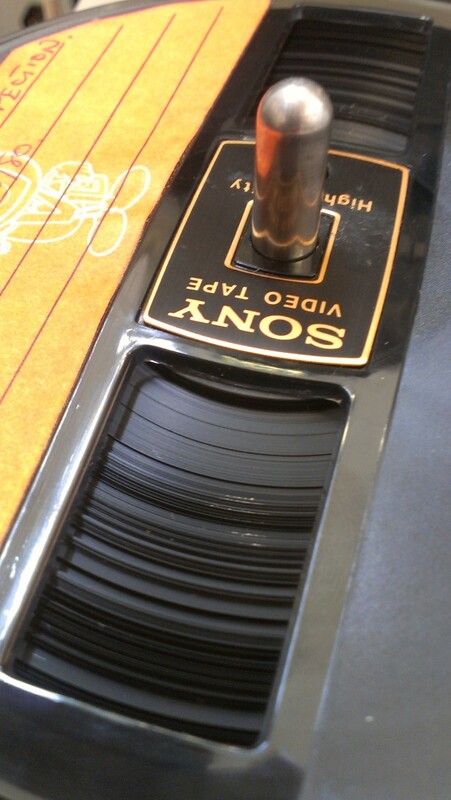 When tape does degrade it is rare event when it cannot be treated and made playable . Optical media that can be burnt form CD / DVD writers uses a dye that the laser alters to create pits that are read back as digital data. CD and DVDr discs use different dyes due to the different data storage needs. The dye can be affected by bright sunlight and compared to commercial or ‘stamped’ optical media it is not as reliable. It has been speculated that the archival quality of CD is superior to that of DVD. The basis for this lay with the physical differences in CD and DVD optical media and the maturity of the technology. In particular, the size of the bit markings in CD media not only reduces the relative effect of media or dye degradation, but also means that more stable, less sensitive dye may be used. One of our audio and video archive customers has a large collection of AVCHD video files that are stored in 1.9GB ‘chunks’ as xxxxx.MTS files. All these files are of 60 minute and longer duration and must be joined, deinterlaced, re encoded to a suitable size and bitrate then uploaded for online access. This is quite a task in computer time and file handling. These small domestic cameras produce good HD movies for a low cost but the compression to achieve this is very high and does not give you a file that is easily edited. The .MTS files are MPEG transport stream containers for H264 encoded video. There are some proprietary solutions for MacOS X and Windows that will repackage the .MTS files into .MOV Quicktime containers that can be accessed by MacOS X or re-encoded to a less compressed format for editing with Final Cut Pro or Premiere. We didn’t need this though, just a reliable and quick open source workflow. The first and most important issue is to rejoin the camera split files. These cameras use FAT32 file systems which cannot handle individual files larger than 2GB so they split the .MTS video file into chunks. As each chunk in a continuous sequence references the other chunks these must be joined in the correct order. This is easily achieved with the cat command. The rejoined .MTS files can now be reencoded to a more manageable size using open source software such as Handbrake. 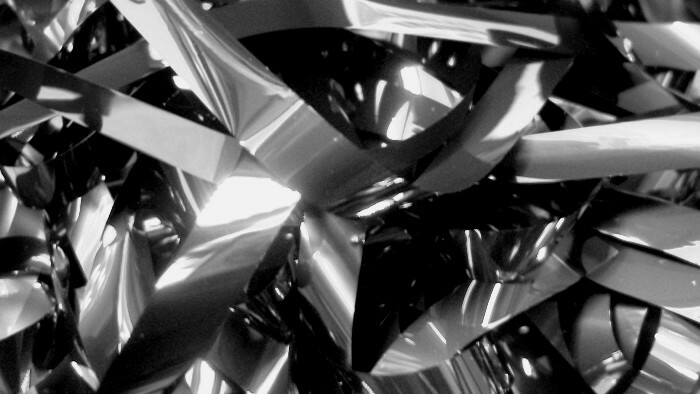 We also needed to deinterlace our footage as it was shot interlaced and it would be accessed on progressive displays. This will increase the encoding time but without it any movement will look odd with visible artifacts. Finding the ‘sweet spot’ for encoding can be time consuming but in this case was important as projected text needed to be legible but the file sizes kept manageable for reasonable upload times!